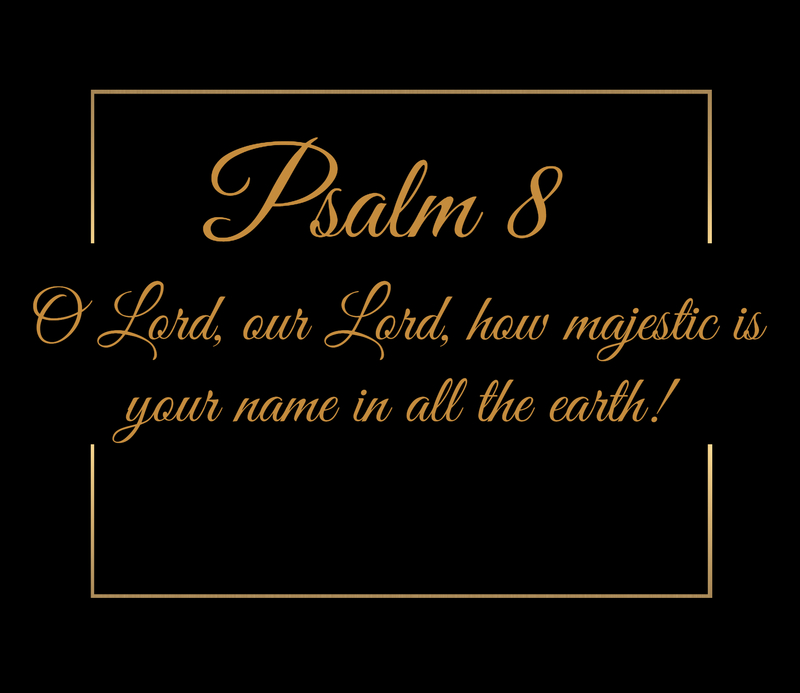 8 O Lord, our Lord, how majestic is your name in all the earth! You have set your glory above the heavens. 2 Out of the mouth of babies and infants, you have established strength because of your foes, to still the enemy and the avenger. 5 Yet you have made him a little lower than the heavenly beings and crowned him with glory and honor. 6 You have given him dominion over the works of your hands; you have put all things under his feet, 7 all sheep and oxen, and also the beasts of the field, 8 the birds of the heavens, and the fish of the sea, whatever passes along the paths of the seas. The extent of God’s majesty is unimaginable to us; what we see in His creation is but a reflection of His true absolute majesty. The created of the universe pales in comparison to its Creator, yet even as a shadow of the Creator His creation leaves us in awe. His majesty is reflected when we look at His heavens, the work of His fingers, the moon and the stars, which He has set in place. His majesty is attested to from the lips of babies and infants. The glorious work of His hands in the creation of life is displayed through the innocence of infants and young children. From the lips of a young child comes the testimony that God has imprinted the knowledge of Himself in the hearts of children and therefore mankind, yet in a child the imprint of God has not yet been tarnished in one so young and innocent. Adam was created with the likeness of God the Father, the Son and the Holy Spirit. Genesis tells us that God said, “Let us make man in our image, after our likeness. And let them have dominion over the fish of the sea and over the birds of the heavens and over the livestock and over all the earth and over every creeping thing that creeps on the earth.” There remains only a vague imprint of that likeness in fallen man, however God still cares deeply for us in our fallen, imperfect state. Jesus declared, “I thank you, Father, Lord of heaven and earth, that you have hidden these things from the wise and understanding and revealed them to little children.” We were all little children at one time but as we grew we became “wise” and the imprint of God became vague. We all to one degree or another have molded God’s likeness within us to more of likeness of ourselves and less of Him. Yet who are we who have done this that God would be mindful of us? Who are we that He would make us a little lower than the heavenly beings and crowned us with glory and honor? Who are we that he would give us dominion over the works of His hands and put all things under our feet, all sheep and oxen, and also the beasts of the field, the birds of the heavens, and the fish of the sea, and whatever passes along the paths of the seas? Just who do we think we are? That, however, is not the question. The question is how does God see us and why has He done what he has done for such lowly creatures? “For God so loved the world, that he gave his only Son, that whoever believes in him should not perish but have eternal life.” It is pure and simple that God loves His creation. He desires that we all walk with Him as He walked with Adam and Eve in the Garden. The question the Psalmist asks is who is man that God would be mindful of us? The answer is obviously incomprehensible to our finite minds but not to God’s infinite wisdom. The love God has for His creation is beyond our comprehension. We are rebellious, ungrateful, self-centered, fallen sinners, however, even in this state of depravity “Christ died for us” (Romans 5:8). John wrote in his first epistle, “In this is love, not that we loved God, but that He loved us and sent His Son to be the propitiation for our sins…. We love, because He first loved us” (1 John 4:10, 19). Such love is so vast, wonderful, and incomprehensible that we cannot even begin to understand it. Who is man that God is mindful of us – we are the object of His incomprehensible love.